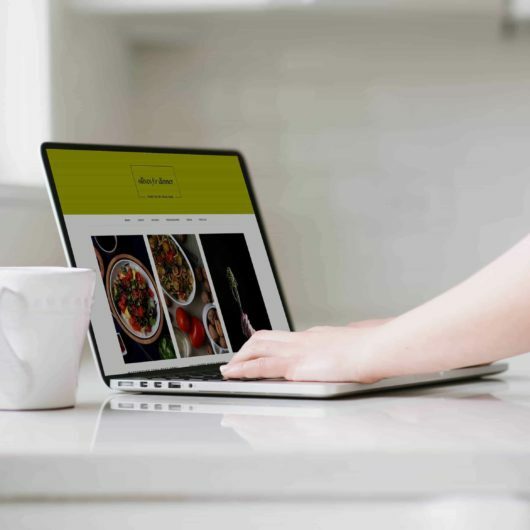 Best Food Blogs of 2019 - Feast Design Co.
What makes a food blog great? 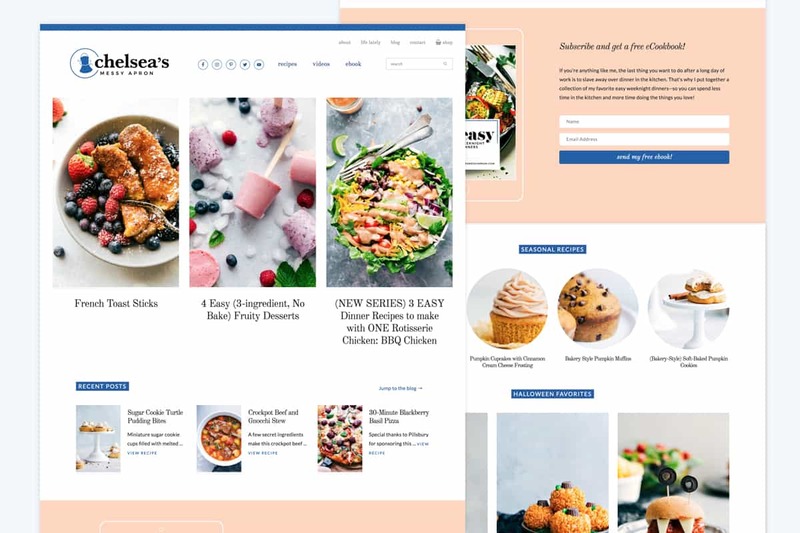 Our themes get the design out of the way and highlights your content and images, so that you can focus on cooking and writing. 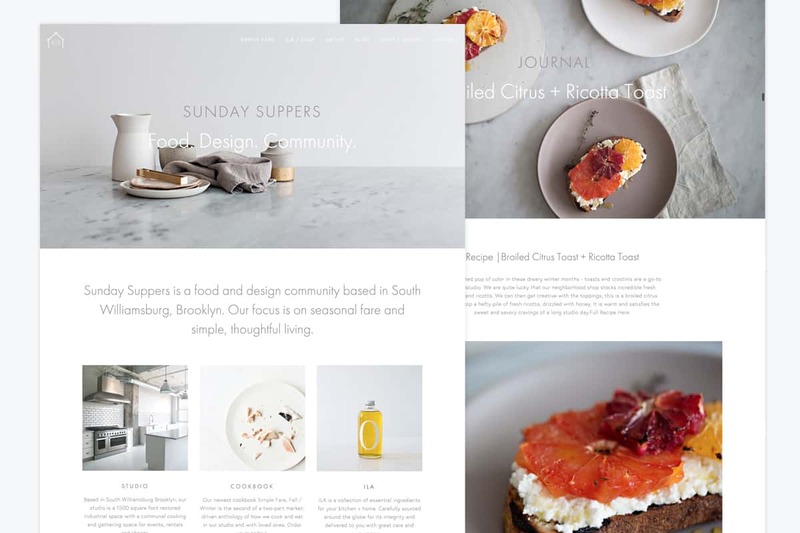 We’ll feature some of the food bloggers using our themes to build their own food blogging empire. Here’s a highlight of some of the best food blogs in our very biased opinion. There’s a huge number of reasons to go vegan – from environmental sustainability, to animal cruelty, community, better health and delicious flavors. The switch from an omnivore diet to purely plant-based often comes with re-learning how to cook and season meals, figuring out which flavors naturally enhance and compliment certain foods. Get meal ideas that will blow your mind from these top food bloggers. Margaret brings together a constantly evolving range of new vegan-based recipes and vegan-oriented products for you to try. Cooking for your family is a constant challenge, with constantly evolving tastes and a delicate balance between quality and quantity. Sometimes you need simple, healthy recipes so that you can move on with the 1,000 other things on your to-do list, and other times you have time to spend crafting a comforting home-made meal. Family meals require recipes for all occasions. Amy has simple recipes for your day-to-day cooking, along with fancier dishes for special events like birthdays and entertaining. Indian food extends far beyond the curry takeout that we’re used to getting from restaurants and mall shops. It’s full of spices that are delicately balanced to complement and contrast each other, often without using sugar or sugary sauces. Meeta grew up in India, bringing authentic Indian cooking experience to her blog. We all like to go out to restaurants to eat something we don’t have to prepare at home once in a while. But homemade meals are always the best, when you can adjust recipes to make it taste exactly like you want it. Made with love is unequivocally true when you’re cooking with your family’s tastes and ideals in mind. Aline started cooking for her family at a young age and now shares her home-made recipes with her extended family: her readers. 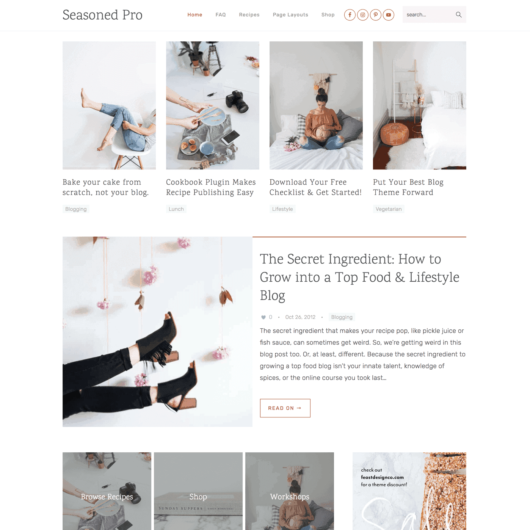 As a designer of the #1 selling food blog theme Foodie Pro, we’ve iterated on the best design for food blogs since 2011. Customers love the simple, minimalist designs, which put your recipes front-and-center. 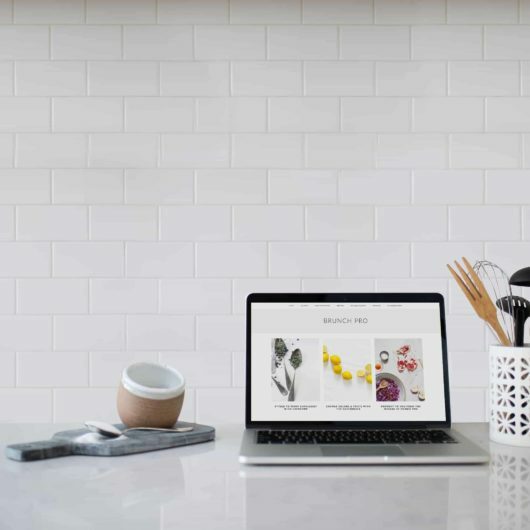 Carefully laid out customizable widget sections means that your images pop, and text flows easily for your readers, enticing them print out the recipes, comment, share and come back time and again. All our themes are responsive, and continually updated to keep pace with best practices. 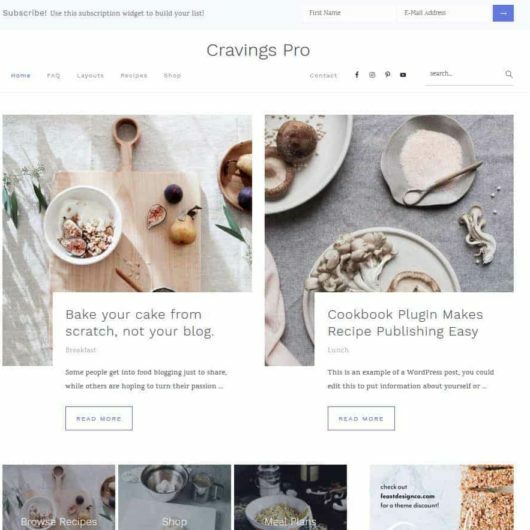 Demand for alternative designs led to the creation of Brunch Pro and Cook’d Pro, and our two newest themes released in 2018: Cravings Pro and Seasoned Pro. Not sure which is right for you? 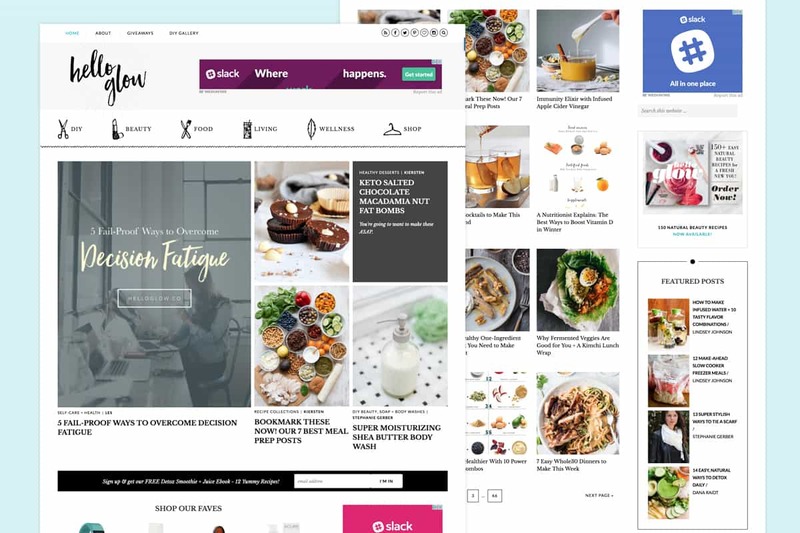 Check out our our food blog theme comparison chart. 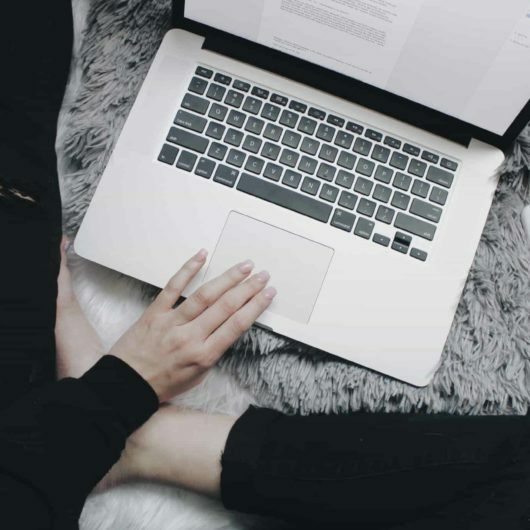 Staring at your blog for dayyzz isn’t getting you anywhere. You’ll hit writer’s block, your inspiration will go stale, and you’ll experience marketing burnout. It’s time to step outside your comfort zone! Move from the couch to your KITCHEN table. Go crazy — change into a different pair of pants even! You know, maybe dark jeans instead of light. Either way, check out some other food bloggers and get motivated. Six years ago, photographer Karen Mordechai gathered a few friends in her apartment for dinner, socializing, and toasting. Since then, her Sunday Supper concept has evolved into a 1500 square foot studio for communal cooking and private events. 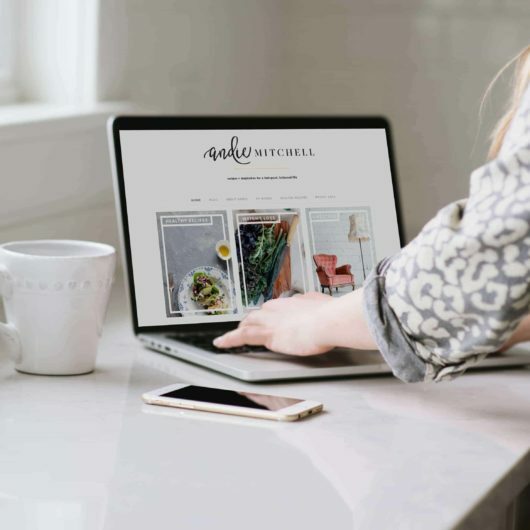 As soon as you hit her gorgeous, minimalist homepage that showcases the allure of using a simple wordpress theme, you feel an instant rush of calmness. Scrolling through her bright and clean photography reminds me of pranayama. The style inspires you to slow down and enjoy the process of cooking, from the selection of healthy ingredients to thoughtful wine pairings. While some of her ingredients may intimidate a novice cook, the recipes are short, concise, and easy-to-follow. In contrast to Karen, Chelsea’s blog is down-to-earth, personable, and bright. And despite the messy apron, her website is well-organized and clean. Chelsea has a degree in Exercise and Wellness, so her recipes are a fun balance of healthy, easy, and chocolate. Currently, we’re drooling over her 7 Layer Bars — the image of melted chocolate is enough to make you give up healthy eating FOR LIFE. Her blog posts combine video tutorials, insights into how she created the recipe, and printable instructions. Want to learn her secrets? Chelsea published a book that spills the beans on how she made $40K in her first year of blogging. While we personally haven’t read the book, you can learn more about it here. If healthy eating and style is your jam, Hello Glow is the way…to go. Stephanie Gerber is a writer and mother of three. And also an avid believer in stripes, long soaks in the tub, and red lipstick. Her website is bright and lush. She brings a unique angle to food blogging by focusing on the whole lifestyle, not just the food. You can tell she has a great team behind the blog because the photography, graphics, and writing are cohesive and on point. If you’re a Meatless Monday Carnivore, you might just sacri-fries your life for this Sweet Potato Burger with Avocado-Lime Sauce. Want to know how you can combine food blogging with your other passions? Explore Stephanie’s page to see how she can make green living, hair care, and cooking come together… easy peasy lemon squeezy. Funky and packed full of personality, Michelle Tam has found the winning combination of niching down and leveling up. Her writing is engaging — especially her about page. She talks about how she wanted to be a flavor scientist and create lab-concocted “Frankenfoods” for a living (her story gets even better from there). 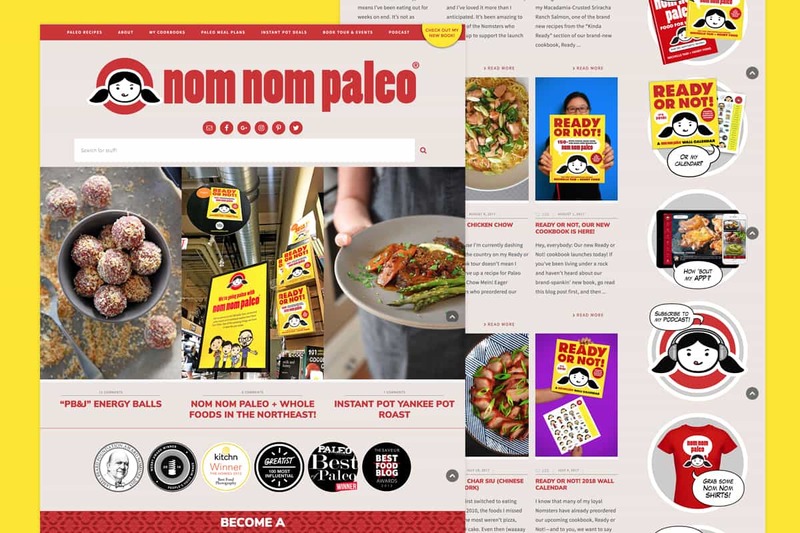 She’s won the Best Food Blog Award by Saveur Magazine, is now a Webby Award-winning cooking app, and won the Best of Paleo Award winning podcast. Oh, she also has a New York Times bestselling cookbook. No big deal. But, let’s talk about her recipes. She has a section devoted to Instant pots or pressure cookers. Real talk: This Pressure Cooker Lamb Shank is making on appearance on our menu soon. Need to see how to infuse your unique personality with an award-winning blog? We recommend following Michelle!